“The Intergovernmental Panel on Climate Change (IPCC) will issue a new report soon on the impacts of 1.5°C of global warming. Limiting average temperature rise to 1.5°C requires both drastic reduction of carbon dioxide (CO2) emissions and removing excess carbon dioxide from the atmosphere. While high-tech carbon dioxide removal solutions are under development, the “natural technology” of forests is currently the only proven means of removing and storing atmospheric CO2 at a scale that can meaningfully contribute to achieving carbon balance. In advance of the IPCC report, we highlight five often overlooked reasons why limiting global warming requires protecting and sustainably managing the forests we have, and restoring the forests we’ve lost. 1. The world’s forests contain more carbon than exploitable oil, gas, and coal deposits, hence avoiding forest carbon emissions is just as urgent as halting fossil fuel use. Recent research suggests that, in order to have a chance of limiting warming to 1.5°C, we cannot emit more than about 750 billion tons of CO2 in the coming century[i]. The carbon in readily exploitable fossil reserves could release 2.7 trillion tons[ii] of CO2 up to 2100. By comparison, forests store enough carbon to release over 3 trillion tons[iii] of CO2 if destroyed. And climate change itself makes forests more vulnerable, including to uncontrollable wildfires. 2. Forests currently remove around a quarter of the CO2 humans add to the atmosphere, keeping climate change from getting even worse. By destroying forests, we not only emit carbon dioxide but also lose the role forests play, through photosynthesis, in taking carbon dioxide out of the atmosphere. Of the 39 billion tons of CO2 that we emit into the atmosphere each year, 28%[iv] is removed on land (mostly by forests), and around a quarter by oceans. The remainder stays in the atmosphere. Maintaining and improving the management of existing forests is a critical part of climate change mitigation, with substantial additional benefits, including reducing air pollution, buffering against flooding, and conserving biodiversity. 3. Achieving the 1.5°C goal also requires massive forest restoration to remove excess carbon dioxide from the atmosphere. Reforestation and improving forest management together have large potential to remove CO2 from the atmosphere. These “natural climate solutions” could provide 18%[v] of cost-effective mitigation through 2030. 4. Bioenergy is not the primary solution[vi]. 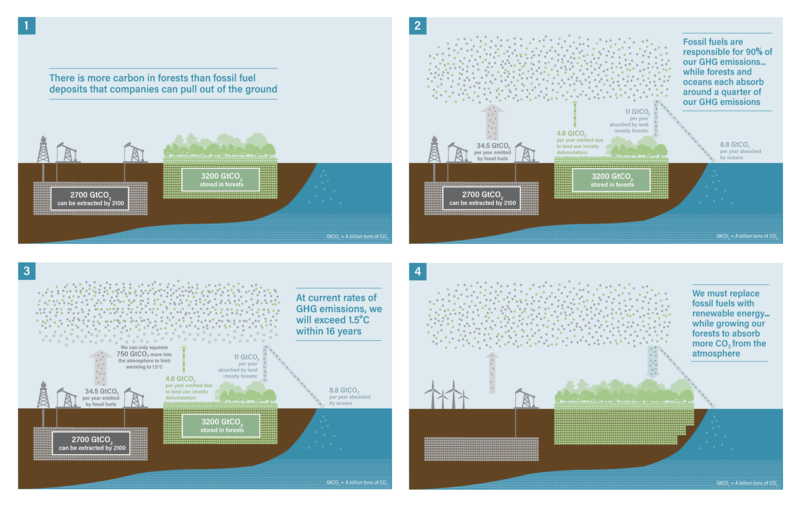 Achieving significant amounts of carbon dioxide removal through use of wood for energy and capturing the resulting carbon in geological reservoirs requires technology that is untested at large scale. In some areas, such as high carbon tropical forests and peatlands—both of which continuously remove carbon from the atmosphere—conservation is the best option. Climate benefits could also come from increased use of sustainably produced wood in longer-lived products, such as buildings, where timber can store carbon and substitute energy-intensive materials like concrete and steel. 5. Tropical forests cool the air around them and the entire planet, as well as creating the rainfall essential for growing food in their regions and beyond[vii]. Standing forests pull moisture out of the ground and release water vapor to the atmosphere, regulating local, regional and global precipitation patterns and acting as a natural air conditioner[viii]. In contrast, cutting down tropical forests increases local surface temperatures by up to 3°C[ix]. These “climate regulation” effects of tropical forests make their conservation essential to protect food and water security. 20. Jo House, Cabot Institute for the Environment and Department of Geographical Sciences, University of Bristol. The views expressed are those of the signatories as individuals and may not be regarded as stating an official position of their respective institutions. [i] Millar, R. J., Fuglestvedt, J. S., Friedlingstein, P., Rogelj, J., Grubb, M. J., Matthews, H. D., … & Allen, M. R. (2017). Emission budgets and pathways consistent with limiting warming to 1.5 C. Nature Geoscience, 10(10), 741. https://www.nature.com/articles/ngeo3031/. Goodwin, P., Katavouta, A., Roussenov, V. M., Foster, G. L., Rohling, E. J., & Williams, R. G. (2018). Pathways to 1.5 C and 2 C warming based on observational and geological constraints. Nature Geoscience, 11(2), 102. https://www.nature.com/articles/s41561-017-0054-8. Tokarska, K. B., & Gillett, N. P. (2018). Cumulative carbon emissions budgets consistent with 1.5° C global warming. Nature Climate Change, 8(4), 296. https://www.nature.com/articles/s41558-018-0118-9.pdf. These recent sources use different statistical methods and base years, all resulting in median estimates of 200-208 GtC remaining for a 50-66% probability of 1.5° C.
[ii] Heede, Richard and Naomi Oreskes (2016). Potential emissions of CO2 and methane from proved reserves of fossil fuels: An alternative analysis. Global Environmental Change 36 (2016) 12-20. [iii] Pan, Y., Birdsey, R.A., Fang, J., Houghton, R., Kauppi, P.E., Kurz, W.A., Phillips, O.L., Shvidenko, A., et al. (2011). A large and persistent carbon sink in the world’s forests. Science 333, 988–993; Pan, Y., Birdsey, R.A., Phillips, O.L., Jackson, R.B. (2013). The structure, distribution, and bio mass of the world’s forests. Annu. Rev. Ecol. Evol. Syst. 44, 593–622. [v] Calculated from Griscom et al (2017). Natural climate solutions (Supplementary Information). Proc. Natl. Acad. Sci. U. S. A., 114, 11645–11650, doi:10.1073/pnas.1710465114. http://www.ncbi.nlm.nih.gov/pubmed/29078344. Categories included in the 18% mitigation potential (from the cost-constrained 2°C scenario) include reforestation, natural forest management, improved plantations, mangrove restoration, peatland restoration (assuming much of this was or is forested), trees in cropland and biochar. All natural climate solutions are assumed to ramp up at the same rate. [vi] Field, C. and Mach, K. (2017). Rightsizing carbon dioxide removal: Betting the future on planetary-scale carbon dioxide removal from the atmosphere is risky. Science, VOL 356 ISSUE 6339; Heck, V., Gerten, D., Lucht, W. and Popp, A., 2018. Biomass-based negative emissions difficult to reconcile with planetary boundaries. Nature Climate Change, p.1; Anderson, K. and Peters, G. (2016). The trouble with negative emissions. Science, Vol. 354, Issue 6309; Turner, P.A., Mach, K.J., Lobell, D.B. et al. (2018). The global overlap of bioenergy and carbon sequestration potential. Climatic Change (2018) 148: 1. https://doi.org/10.1007/s10584-018-2189-z. [vii] Lawrence, D. and Vandecar, K., 2015. Effects of tropical deforestation on climate and agriculture. Nature Climate Change, 5(1), p.27. [viii] Ellison et al (2017). 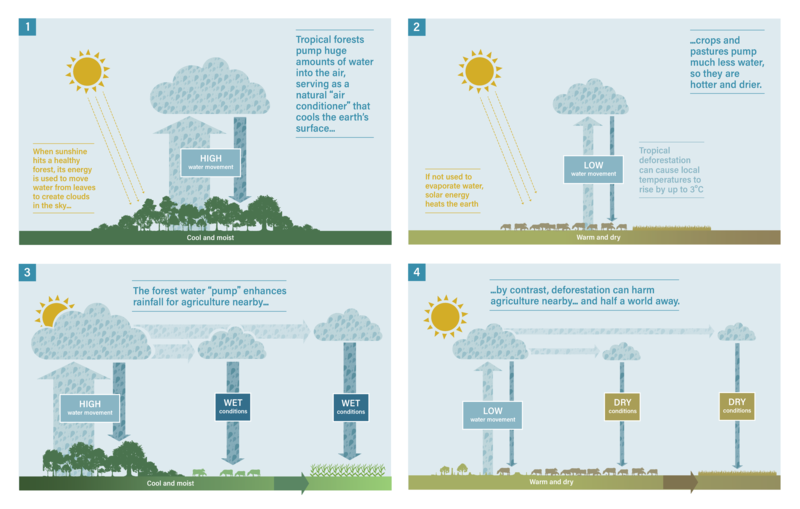 Trees, forests and water: Cool insights for a hot world. Global Environmental Change, Vol. 43, Pages 51-61. [ix] Silvério, D.V., P.M. Brando, M.N. Macedo, P.S.A. Beck, M. Bustamante, and M.T. Coe (2015). Agricultural expansion dominates climate changes in southeastern Amazonia: The overlooked non-GHG forcing, Env. Res. Lett., 10, 104105, doi: 10.1088/1748-9326/10/10/104015; Coe, M.T., P.M. Brando, L.A. Deegan, M.N. Macedo, C. Neill, and D.V. Silvério (2017). The forests of the Amazon and Cerrado moderate regional climate and are the key to the future of the region. Trop. Consv. Sci., 10, 6pp., DOI: 10.1177/1940082917720671.